Drop us a line, with any general questions about the OxyGeneo™ 3-in-1 Super Facial. Are you an Esthetics Professional in Canada? Are you a professional interested in the Oxygeneo™ technology? 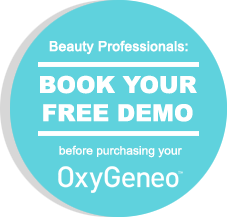 If you want more information on a FREE DEMO, please complete this form and a representative from DermaSpark will contact you! DermaSpark is Canada’s exclusive distribution partner of Pollogen Ltd. At DermaSpark, we understand that ‘one-size’ doesn’t fit all when it comes to equipment. We offer choice so that our clients get the right equipment for their business.